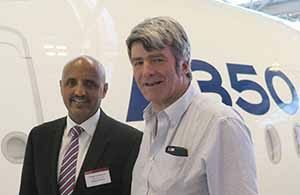 Tewolde GebreMariam, CEO of Ethiopian Airlines took delivery of his airline’s first A350 in Tourlouse and accompanied it back to Addis Adaba on the ferry fvlight. It is the first A350 to be operated by an African airline, the fourth to be owned by Aengus Kelly’s Dublin based AerCap leasing company, and the 26th to be delivered by Airbus. 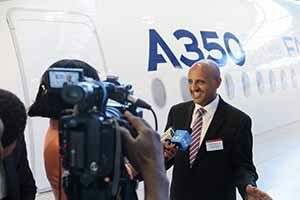 Philip Scruggs the President and CCO of AerCap attended the media breifing on behalf of the company. Tom Williams, COO of Airbus breifed media, of which 40 travelled to Addis Adaba on the ferry flight. Joaquin Toro-Prieto conrimed that Airbus has firm orders for 802 A350 aircraft of which 77 are bound for lessors, 25 of them due to be delviered to AerCAP. AerCAP have a fleet of 1,230 aircraft and 441 on their order book. They are the biggest players in Ireland’s burgeoining aircraft leasing industry with $44bn in assets, $8.5bn of equity, and income of $223m in quarter one, 2016. The company executes two widebody and five narrowbody aircraft transactions per week and buys or sells an aircraft every three days. Ethiopian’s aircraft seats 343 in 30-313 configuration. It is expected to serve trunk routes to Beijing, Dubai, Johannesburg and Lagos. Watch here interview with Tewolde GebreMariam, CEO of Ethiopian Airlines in which he talks about the prospects of using US CBP pre clearance at Dublin. Watch here presentation by Tony Flynn to the Irish travel trade on behalf of Ethiopian Airlines.